Hello lovelies! 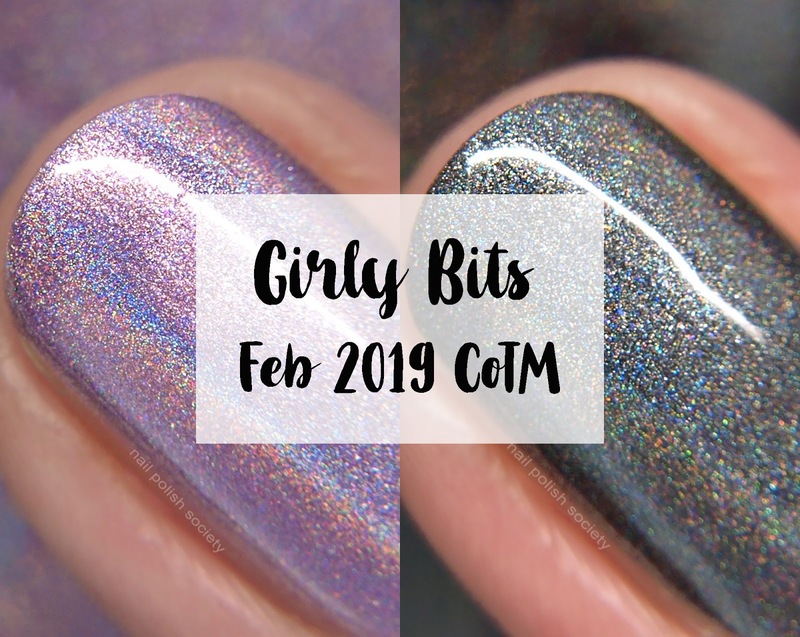 I have the two February Color of the Month polishes from Girly Bits to share! They are both straightforward linear holographics with great formulas. Let's take a look..
Budding Romance is a light violet/pink strong linear holo. This had a very smooth, thin formula. Shown is three thin coats plus top coat. Steel My Heart is a slate gray linear holographic. This has a bit of a reflective quality to it, a silvery tone that pops from the dark gray. Shown is two coats plus top coat. Both of these polishes are 5 Free, cruelty free, and vegan. $16.50 CAD each (approx $12.10 USD) or $30.00 CAD (approx $22.00 USD) for both from Feb 01st- 10th, in the Early Bird Promo Listing. After that, they will continue to be available for purchase individually until March 1st, at full price only. Happy New Year, Welcome 2019!